Islamic militants stormed a Nigerian secondary school campus early this morning (Feb. 25), locked a boys’ dormitory and set it on fire, killing those who tried to flee and burning the rest alive. News accounts report that suspected Boko Haram militants killed at least 43 young men during the pre-dawn attack at the school in Buni Yadi, in the north-eastern state of Yobe. A Christian charity active in Nigeria said its sources expect the death toll to rise to 100 or more. “I heard the cries of some people outside the school even before they invaded the school,” said a student who managed to escape, as quoted by Open Doors International, which provides aid to Christians who live under pressure because of their faith. Various news accounts said the attackers shot or slit the throats of the boys trying to flee the burning dormitory. Others died amid the flames. An unverified number of others were wounded. Photos posted on Twitter, purporting to be of victims of the Buni Yadi attack, showed the bodies of teenage boys lined up on the ground in pools of blood. The women’s dormitories were spared violence, the Associated Press reported. The AP, citing school spokesman Abdullahi Bego, said the intruders told the women to leave the school. Several buildings on the campus were set ablaze, according to news reports. The school was closed and surviving students sent home. Parents were streaming to the school to find their children. The AP also said Ibrahim Gaidam, governor of Yobe state where the attack occurred, said Nigerian soldiers had abandoned a checkpoint near the school before the assault began. Yobe and two other northern states have been under a state of emergency since May 2013. 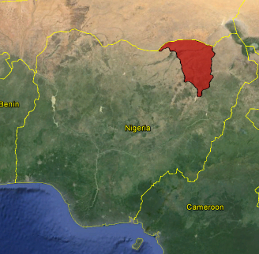 Following a Feb. 15 attack on the Borno state village of Izghe that left 121 dead, Borno Gov. Kashim Shettima declared Boko Haram has better equipment and weaponry than the Nigerian Army. On Monday, just hours before the midnight raid in Buni Yadi, Nigerian President Goodluck Jonathan said Shettima is wrong. “If we pull out the military from Borno state, let us see if [Shettima] will be able to stay in the government house,” Jonathan said. Since 2009, the Boko Haram insurgency has killed thousands of people in its campaign to rid the country of Western influence and impose strict Islamic law. Though Nigerians of every religion and ethnic group have been attacked, Boko Haram has directed some of its violence toward Christians. It’s unknown whether Tuesday’s raid on the school was directed at Christians specifically, though Open Doors said local church sources confirmed Christians were among the casualties. The attack revived memories of a September 2013 attack on the Agricultural College campus in the Yobe town of Gujba. About 30 gunmen stormed the dormitories, roused the sleeping students, gathered them into a single place, and shot them. At least 65 students were killed.